Are You Looking For An Awning Or A Canopy? A canopy is a free-standing structure that is drilled into the ground versus an awning that attaches to a wall. Awnings and canopies both have some similar uses. This is why people often use the terms interchangeably, but they have some distinct differences depending on what you are looking for. When choosing which one is best for your home or business, there are some key factors to take into consideration. The main difference between the two is that an awning Is a covering that attaches to the wall of building and a canopy is freestanding, similar to a tent. Here are some of the other differences between an awning and a canopy to help you narrow down which is best for you. Awnings are generally smaller than canopies, reaching a height of 20 feet and extending around 15 feet. They are made for small or medium sized patios as well as doors or windows. Slide-wire cable awnings are the only exception, as they are made in bigger sizes. Canopies are designed for bigger structures and can reach 21 feet long and extend around 30 feet. 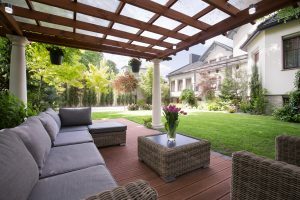 This means that they are more versatile when it comes to size and can cover almost any deck or patio. This makes canopies better suited for social events because it can a larger number of guests out of the sun. Canopies are best left to professionals for installation. They require a lot of precise measurements before they order the parts since canopies are drilled into the ground. Sometimes, the support that you need may need to be manually constructed if it isn’t available to be purchased. With awnings, you could install them yourself if you have a team of people to help because it can be pretty heavy. If you don’t have any knowledge of basic carpentry, it’d probably be best to consult a professional to install your awning or canopy. Awnings are significantly more expensive than canopies, ranging anywhere from $1500-$5000. Canopies tend to be around $150-$800. These are rough estimates and price depends on the size and fabric that you choose from your canopy or awning. You could also invest in additional features such as if you want a motorized retractable awning that can be moved with the press of a button. There are things like weather sensors for retractable awnings to give them extra protection. As far as canopies go, the cheaper options are the pop-up ones, which are temporary and used for quick events. An event like a wedding would require a more expensive option. While you will surely save more money with canopies, a lot of homes don’t have the size of proper design for them, making them better suited for commercial properties or events.